Online Application Details for V.O. 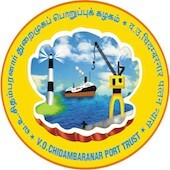 Chidambaranar Port Trust VOC Port Recruitment of 2 Assistant Traffic Manager and 1 Senior Assistant Traffic Manager is given below. Application form and duly attested documents are to be sent to The Traffic Manager, V.O.Chidambaranar Port Trust, Traffic Department, Tuticorin – 628 004 (Tamil Nadu). In envelope super scribed with 'Application for the Post of Post Name'.